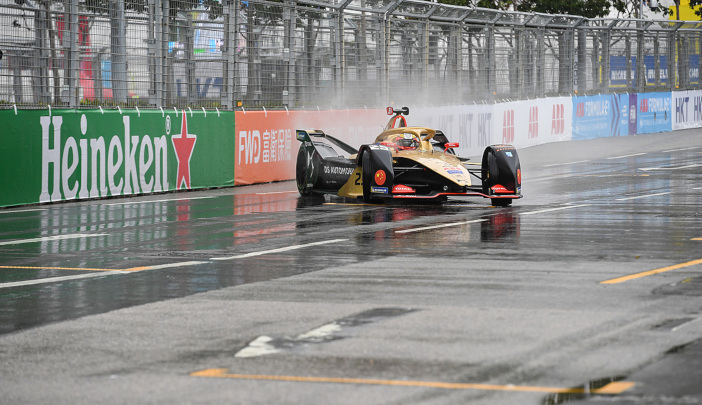 Formula E and branding supplier CSM Live are to use sustainable non-PVC material for trackside signage to reduce plastic production and waste. CSM Live has developed the sustainable signage solution after a 12-month research project. The sustainable alternative will be applied to the barriers lining each circuit of the all-electric race series – starting in the Italian capital for the Rome E-Prix on April 13. The adhesive film, which is made with supply chain partner Hexis, replaces any previously used materials and significantly limits the environmental impact of the series by cutting back on 35km (22 miles) of PVC waste. The new signage is made of polypropylene and has the same qualities as its PVC predecessor. “Working together with a trusted and credible supplier in CSM Live, we’ve been able to deliver sustainable solutions for branding and trackside signage,” said Julia Palle, senior sustainability consultant at Formula E.
“Not only does the non-PVC material provide similar levels of strength but each aspect has also been carefully considered in order to fully limit its impact – from production line to reuse and recycling. Situated in the heart of Rome’s EUR district, the signage will mark out the 2.87km track, which weaves its way around landmarks such as the Obelisco di Marconi and the Colosseo Quadrato. “To completely close the loop, we’ve looked at all elements of our supply chain and we’re thrilled to be able to deliver this new product – pioneering the way for non-PVC solutions to be used industry-wide across the globe,” said Graham Clark, managing director of CSM Live.